Recipe courtesy of Charmian Christie of The Messy Baker (www.themessybaker.com). Cones aren’t just for ice cream! These tortilla wraps are more fun than a sandwich, yet easy to make. 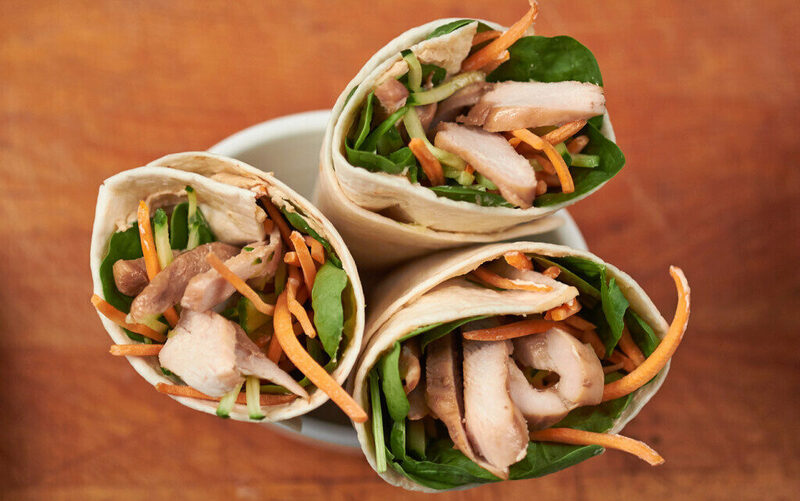 With endless customization options for the wrap and vegetables, even the fussiest eater will want to dig in. Best of all, the spinach layer prevents Soggy Sandwich Syndrome! If you can’t find turkey breast strips, cut boneless, skinless turkey breast into strips about 1 ½” (3.5 cm) wide and ½” (1.5 cm) thick. The length will vary, but that doesn’t matter since you’ll be slivering them later. Place the turkey strips in a glass or stainless steel bowl. In a small bowl, whisk together the soy sauce, honey and lemon juice. Pour the marinade over the turkey and toss to coat. Let sit 15 minutes, while the oven preheats, or cover and refrigerate overnight. Preheat the oven to 375°F (190°C). Line a rimmed baking sheet with foil. Place the marinated turkey strips on the foil, discarding any leftover marinade. Bake 12 to 18 minutes or until the turkey is cooked all the way through and the internal temperature reads 165°F (74°C). 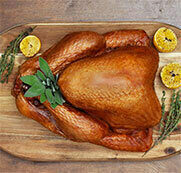 While the turkey cools, slice the carrots and cucumber into matchsticks using a vegetable peeler or mandolin. Slice the cooled turkey lengthwise into ¼” (0.5 cm) strips. In a small bowl, mix the cream cheese, soy sauce and honey until smooth. Cut a tortilla in half to form a half moon. Spread entire surface with 1 tablespoon (15 mL) of the cream cheese mixture. Place a single layer of baby spinach leaves over the surface, leaving a 2” (5 cm) strip of exposed cream cheese down the left side of the tortilla. Layer a 3” (6.5 cm) strip of carrot and cucumber slices down the centre of the tortilla, leaving an inch (2.5 cm) at the bottom. This allows the cone to form a tip. Top the vegetables with 1/8th of the turkey slices. Fold the right corner of the tortilla over the filling to form a wedge. Firmly roll the tortilla into a cone, pressing gently so the exposed cream cheese seals the wrap.